ZONG came up with a new offer named as Zong’s Ramzan Value Time Offer, Through this offer you can avail calling rates of 2.99+tax/hour throughout the holy month of Ramzan. To subscribe you can dial *711# or write sub in a text message and send to 711. To unsubscribe the offer Send unsub to 711. This offer is valid from 1st – 29th Ramzan. There is a one-time subscription charge of Rs 10+tax. Offnet calls will be charged as per tariff plan. 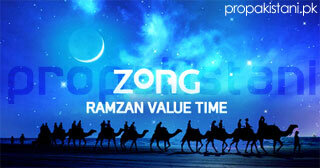 The timing you have mentioned for Ramadaz Value Time Offer is incorrect for Sehri… The timing is 12am to 4am. Please correct this. Thanks for mentioning, corrected! though Zong’s official website has this error. Ufone, Telenor already have these packages for 24/7. What is special in zong? Thats good sacha kaka zong is the best network of pakistan for calls and sms i love ZONG ..
Ye kesa offer hai. S say acha offer tu ufone Ramzan k elawa b deta hai. The timings they mentioned are useless. Firtly, 12am-4am is usually Sleeping and then Sehri preparation times at homes and then at 2pm, hardly anyone would be taking this offer after day long of humidity (or hot weather), Who would like to feel thirsty? Had the offer been at 8pm-11pm or 4am-8am, It could be much more useful for people but Zong have made it useful for themselves only by offering it at times when many might like to let their tongues rest. Uth package round the clock ye offer dai raha hai.. Free call after 1st min..